Diapason d'or de l'année 2011; Opus: "Okko Kamu has returned to Sibelius, and a miracle has happened once again". To many, the Lahti Symphony Orchestra has become synonymous with excellence in Sibelius repertoire. Its numerous recordings with the previous chief conductor Osmo Vänskä have received countless distinctions and awards, and the orchestra is universally regarded as having a very special affinity for the music of their great compatriot. On the present disc it is Okko Kamu, Vänskä's successor as chief conductor, who wields the baton. Kamu has been a presence on the international scene ever since the early 1970s, when he made a highly-acclaimed set of Sibelius symphonies in partnership with Herbert von Karajan. 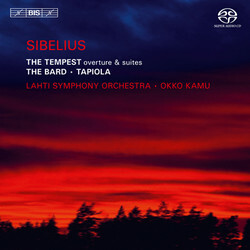 Here three other works by Sibelius make up the programme, which opens with music for Shakespeare's play The Tempest, for which the composer in 1925 wrote the most ambitious of his several theatre scores. For concert use he later selected the Overture and two Suites recorded here. 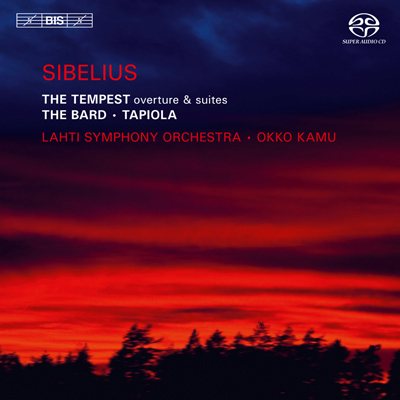 In 1926, a year after The Tempest, Sibelius again turned to the realm of magic in his masterful evocation of the forest, the symphonic poem Tapiola. The title can be translated as ‘the domain of Tapio’, god of the forest in Finnish mythology, and according to Walter Damrosch, who conducted the first performance, the audience was ‘enthralled by the dark pine forests and the shadowy gods and wood-nymphs who dwell therein’. From the start the work has been regarded as one of the greatest masterpieces from Sibelius’ pen. These two large-scale works are here separated by the seven-minute long symphonic poem The Bard from 1913, a work which in its treatment of the thematic material and the chamber-music-like quality of its scoring invites comparison with the Fourth Symphony of two year’s earlier.